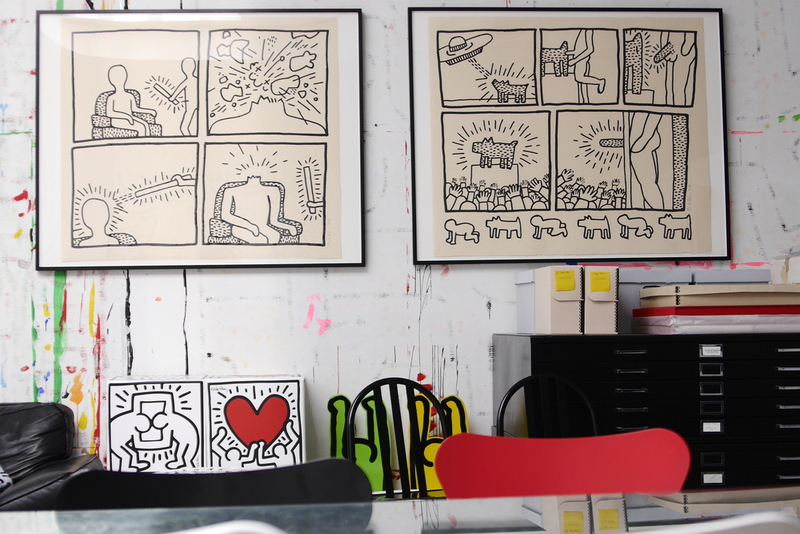 This month in New York we have the rare opportunity to see a Keith Haring exhibition that opened on May 3 at the Gladstone Gallery in Chelsea, and which will run until June 14. The show is comprised of eight large scale paintings and tarps showing the colorful compositions that Keith is known for; pieces that depict a deeper message that encompass his activism and a political voice that was necessary back then and is still so relevant now. 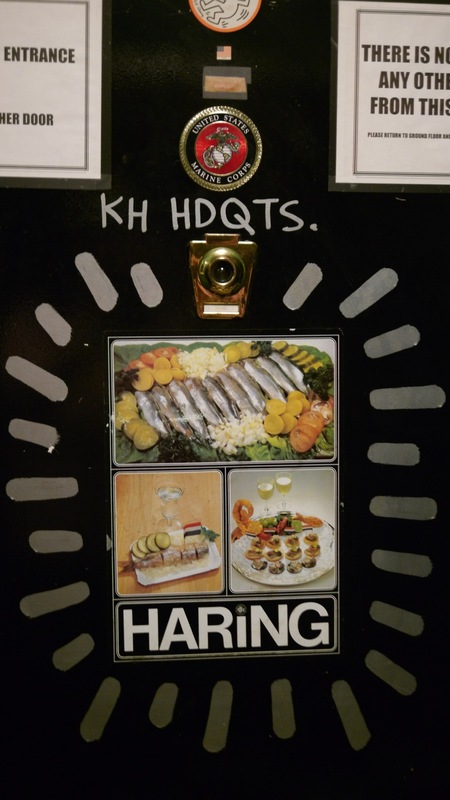 I'm an admirer of everything that Keith did, from his canvases to his Pop Shop. Keith was an extraordinary artist, a genius with a generous spirit and a convivial man who loved to share his creativity with the world. However, for a few years now, I've been thinking that his legacy could have never had the impact that it still has 24 years after his death, had it not been for the fierce determination of Julia Gruen. 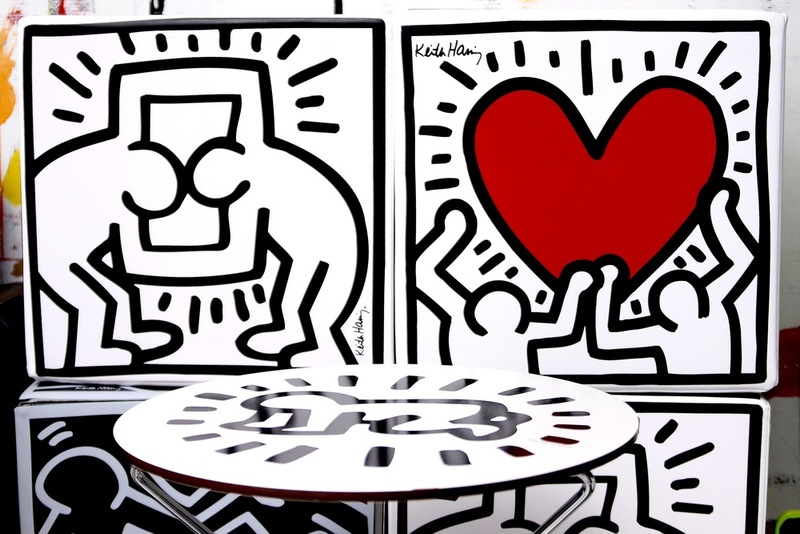 Julia was Keith's assistant and studio manager during the last six years of his life and the director of the Keith Haring Foundation since its inception in 1990, where she remains to this day. Her honesty, integrity, elegance, beauty and respect for Keith's oeuvre and for anybody who comes in contact with her, are just a few of the qualities that have turned me into a personal fan. And there is nobody better equipped than Julia to answer questions about Keith’s life and his Foundation. Maria Brito: One of the most interesting things about the Foundation is that it is run out of the same space that Keith used as his last studio. This studio is culturally relevant and important not only because Keith was so prolific and produced so much in this space but also because it's reminiscent of the Eighties in New York, the checkerboard floors, the skylights, the high ceilings, the open loft space. Julia Gruen: Keith didn't tell me that we had to stay here but we have been here since 1985 and I feel that most likely this would have been his wish. We created the internal walls and added desks, computers and so on. This originally was just a big ample space where he worked very diligently every day. He was clean, tidy and organized but those splotchy marks of paint on the floor are original and authentic, he left them here and they will remain here. The walls bear the traces of some of Keith’s work because in many cases he chose to work on raw, unprimed canvas and the paint bled through on to the walls, so what you see are the “ghosts” of a variety of pieces that were painted on these walls. MB: Were you partying with Keith and going out with him, because I think that you are so private - I could not get a lot of information about you in my research although I have known you for a few years and you had such a close relationship with him. JG: I started working for Keith in May of 1984 and I stayed with him until his death in 1990. My job was basically to do anything he asked me to do. We came from different backgrounds and he had never worked with someone who was previously unknown to him. But I was. I had never met him before. We were both just 25 when we met. We had great chemistry, got along really well, had lots of friends in common and went to the same clubs -- that is what actually formed the initial bond. I grew up in the East Village; my mother is a painter and my dad is a journalist, biographer and photographer, whose first book was about the East Village scene in the 1960s and who, many years and many books later went on to write Keith's biography. I think Keith liked all of that about me although I certainly didn’t tell him everything during our initial interview. MB: How was your day-to-day with Keith? He would come in at 11 am or noon, we would sit down and go over a series of things that had to get done throughout the day, he would give me my instructions and we would get on with our jobs. There was a lot of activity in the studio. He loved people to come visit and drop by and sometimes it became chaotic, but it was good like that. He didn't chase after peace and quiet, actually the opposite was more accurate -- he liked to be social, surrounded by people and engaged with them. The studio was the place that housed his creativity. I worked mostly as Keith's business person, which included the running of the studio. I gladly helped with the various events Keith organized and while I was always a guest at these events, we were very clear about drawing a line between the professional and the personal. I had my own world and Keith had his – these worlds definitely overlapped, but keeping things separate was important. Keith was very clear; not necessarily through words but always through his actions and through what he communicated in his art. That's what has informed my past 24 years at this Foundation. I had the privilege of being in his orbit five days a week for almost six years and I have firsthand knowledge of his philosophy, his approach to life, his tolerance, openness, generosity. I'm a better director and a better person because of all I learned from Keith. He made my life better and I carry that legacy with me. MB: When did you and Keith start discussing the idea of the Foundation? Not long after Keith learned that he had a disease that would likely take his life, he decided he wanted to establish a Foundation in his name, and he asked me to be its director. It was a great honor, and of course I agreed, but little did I know I would be here 24 years later (30 if you count the first six I worked for him during his lifetime). In the immediate aftermath of his death, the enormity of the loss along with trying to manage and be responsive to so many people’s expectations, organizing his memorial service and simultaneously dealing with the nuts and bolts of being an executor of his estate and director of the Foundation just kept me busy and overwhelmed -- I had so many things to do that I was numb. We all have outlived Keith who died at the very young age of 31. When I turned 32, I was shocked. “Wow, I'm older than Keith now”. That's what I thought, and that put in perspective just how young he was when he passed. The AIDS epidemic was taking so many young lives at that time, so many friends were dying. It was a very sad time but we had to keep going. MB: I admire the way that you have handled the Foundation and Keith’s estate. For example, when something is sold, it always has a very dignified treatment, at least in connection with what you control directly. My instincts and common sense have helped me to forge great relationships with galleries, museums, advisers and so many others we come in touch with. My relationship with Keith and my knowledge about his philosophy and his work have obviously offered some essential guidance, but I never had a master plan. The mantra that we still use in the Foundation is: What would Keith have done? We don’t always have that answer and we have had to adapt in many ways. When Keith died there was no Internet, no cellphones, no social media and in many respects, the world wasn't like it is today. The Foundation’s income doesn't come from fundraising. That's not what we do because Keith didn't want it that way. We are self-supporting and generate income from licensing our copyrighted images and from the judicious sale of select artworks from our collection that we entrust to very specific galleries. Contrary to what people think, when Keith died, he wasn't rich. It was a different economy back then and he had certainly started making some money but he was by no means a wealthy man. So the amount of philanthropy the Foundation can do is entirely dependent on the good management of our assets. MB: What's next for the Foundation, what are the new shows coming up? Our core mission, besides expanding and sustaining Keith’s artistic legacy and keeping his voice alive, is to fund programs that provide education for children in need and to support organizations which engage in education, prevention, care and research directly related to AIDS and HIV infection. Keith himself established our mission. He didn't direct us to provide funds to support younger or emerging artists. I don’t know if he had this specific thought, but it's certainly much easier for us to evaluate the merits of an organization rather than those of an individual artist. Keith loved and was loved by young kids, so his choice of providing funds for educating those in extreme need makes perfect sense. Interestingly, many children (including mentally disabled children) can get an enormous benefit out of looking at and interacting with his drawings and paintings. Keith designed and created coloring books, counting books and other educational tools for kids. As for the other part of our mission, the AIDS epidemic was possibly the single most devastating and personally impactful social crisis of Keith’s lifetime. His own activism combating this devastating disease and stigma made his desire for us to help those affected inevitable and imperative. Regarding exhibitions, there will be a show of editions at Pace Prints in the fall, and “Keith Haring: The Political Line” (a smaller version of the show of the same name that was in Paris last year at the Musee d’Art Moderne de La Ville de Paris and Le Centquatre), will open at The de Young Museum in San Francisco on November 8th and will run until early February 2015. This show will travel on to Munich and Rotterdam. We also expect the show to have one more United States venue opening in early 2016, but this has yet to be confirmed. Contact with the public is one the most gratifying parts of my job. When I talk to or observe people as they get lost in Keith's world, that makes it all so much more worthwhile. Last year I went twice to the show in Paris – when it opened and then a couple of months after that - seeing the lines of people waiting to get in, and observing how young so much of the audience was made me so happy. It often occurs to me that some have no idea how the world was back then and how or why these pieces were made and conceived and all the things that Keith went through during his life. But I don't mind if people first meet Keith through a T-shirt design. What’s important is that his images still awaken interest in those young people and being close to that is incredible for me. I guess I'm a kind of living bridge between Keith’s lifetime and now. I didn't make the art but I was very close to the man who did and I am forever grateful that he had the faith to entrust me with this privilege and responsibility.